Book I of the When Women Were Warriors trilogy is now an audio book! I've been meaning to blog about the recording experience, but it's been such a busy year that blogging has had to wait. Now that the audio book has been officially released, I can take a bit of a breather and try to catch up. 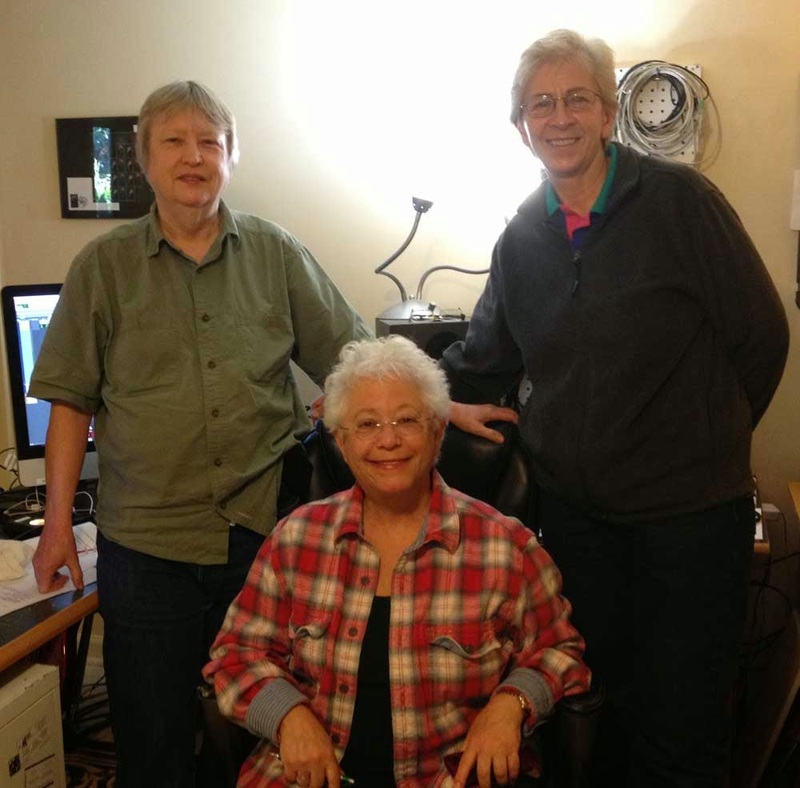 We raised the money for the project through Kickstarter, and one of the perks was a daily email about the experience of making an audio book with Janis Ian and Dog Ear Audio. I was thinking I would put a condensed version of those emails here on my blog for everyone to read, but as I looked them over, I realized that the best part was the immediacy of the experience that I was able to share with the folks who funded the project. So I am reproducing them in their entirety here. Karen and I arrived in Nashville yesterday (Saturday) and had a lovely dinner with Janis and her wife Pat at their favorite sushi restaurant, where we talked for almost four hours about everything under the sun. I have never met a famous person who is as real as Janis. Her talent aside, she is a first class human being, which I think most of you already know. If you haven't read her autobiography or listened to her Grammy-winning audio book, please do, because you will discover an extraordinary person. I'm sure I'll have a lot more to say about Janis as the week goes on, but that's enough for now. This afternoon Karen and I went to see the studio where we will be recording. I think Karen will be putting up some pictures on Kickstarter and telling you more of the technical details. From the author's perspective, it looks to be a place where some serious work gets done. Karen had a very technical talk with our engineer, Randy Leago, while I gawked at an impressive collection of electronics. It's past my bedtime, so I'm going to sign off now. I need to be bright-eyed and bushy-tailed for tomorrow! Karen and I are beyond bushed right now, but we had a GREAT!!! day in the recording studio with Janis. What can I say about Janis except that she is the consummate professional. That she came prepared goes without saying, but the heart she brought to the work is so above and beyond that I'm still in awe. She knows the characters through and through, and her voice brings them to life. I asked her, Do all the authors weep when they hear you read their work. She said yes. And of course I did too, because the story is not only close to my heart, but buried deep inside it, and her rendering of my words moved me to tears more than once. As the author, I am hearing the story read (performed is a better word) with emphases and intonation that are different from the way I heard it in my head, because, as Janis warned me when we started, the work will be her interpretation of the book. What that does for me is show me the story from another angle, which only makes it richer. The technical part of the recording went very smoothly. Karen and Randy Leago, our engineer, made it look easy, but having worked in broadcasting in a previous life I know the degree of expertise and talent required for this kind of work. It's enough to ask of an artist to give her best performance, but when the work is constantly interrupted by technical glitches, it's much more difficult. I think we had two or three technical glitches (a vanishingly small amount in my experience), and a few interruptions by airplane and car noises. Karen can tell you more about Janis's error rate (# of goofs per page) which is also vanishingly small. Thank you all so much, and special thanks to Liz Bradbury's wife Trish for the lucky socks she knitted for me. I'm going to wear them every day! We had another great day in the studio today. Janis is getting through the material more quickly than we had anticipated, which is good, because if we run into trouble later, we'll have time to deal with it. First thing this morning we had a strange hum. It turned out to be the incandescent bulb Janis was reading by. Gremlins like that happen in every project, and they tend to appear and disappear capriciously. Randy, our engineer, figured it out in record time, and the rest of the day went smoothly. While Karen and Randy are watching the script and the waveforms and listening for extraneous noises like airplanes, I just sit with my eyes closed and listen, and Janis takes me there. She conjures the settings--both emotional and physical--and brings the characters to life. Just wait till you hear Gnith! Here's something I didn't anticipate. While we all know Janis has a lovely singing voice, her speaking voice is just as beautiful. Now I understand how lucky we are to be working with a musician, because her sense of timing and the way she renders emotion come from that sensibility. The story is a heroic epic, and Janis is making it sing! Tomorrow morning we'll be joined by four of our Kickstarter contributors. I hope the experience is as magical for them as it has been for me. We had another outstanding day today. This was the day that our four Kickstarter contributors joined us. Pam, Terri, Wendy and Lori met Karen and me at Randy's studio, and we had time to show them the studio layout and take some pictures before Janis showed up. Then we all took pictures with Janis. Karen is going to be posting some of them to the Kickstarter project page. Today's energy was different from the first two days as we were all getting acquainted, but once the work began, our guests settled down to listen. We were all on headphones, so speaker noise wouldn't bleed into the sound booth. Since we were well ahead of schedule, we took a long lunch break. Our guests had come from as far away as Seattle, Florida, and Iowa. They are an impressive group of very accomplished women, and they had been so well-behaved that Janis invited them to stay for the rest of the day. After we finished, Janis hung out with everyone for an hour or so. She usually finishes the day on empty, but the energy of the group held her up, I think, and she regaled us with insider tales of the music industry. Karen and I took our guests out to dinner and we all got to know each other a bit better. Terri and Wendy are one of the funniest comedy teams I've ever met. Someday they're going to have to take their show on the road. Lori took a picture of my lucky socks. When she gets home in a few days, she'll post it to Facebook and then I'll steal it and put it on the When Women Were Warriors page. Janis was, of course, her brilliant self, and she made me cry again in front of everybody, but I didn't mind at all. The folks who haven't read the book might find this update a bit of a spoiler, so I'll set it off with a spoiler alert. Those of you who have read the book may recall the Spring Festival chapter. It was the one part of the book I was most worried about, because a less than perfect reading would have been a disaster. Not to worry. Janis was flawless. She just about blew the top of my head off, and my skin has only just stopped tingling. Ye shall dance, sing, feast, make music and love, all in Her praise. For Hers is the ecstasy of the spirit, and Hers also is joy on earth; for Her law is love unto all beings… Let Her worship be within the heart that rejoices; for behold, all acts of love and pleasure are Her rituals. Janis read the chapter as if these words were engraved upon her heart. As if it wasn't enough that I get to come to Nashville and record an audio book with Janis Ian, tonight Karen and I went to Puckett's Boat House in Franklin, Tennessee, to hear our engineer, Randy Leago, play with the Cajun Zydeco Band, Ya Ya. I live in a tiny town in the mountains of central California, and we don't get a lot of live music close by, so it was a real treat for me. They put on a great show. It was all I could do not to get up and dance, but a little old lady rocking out to zydeco isn't what most folks want to see. ;-) It was a great way to unwind after an intense day. Ladies and Gentlemen, it's in the can, as we used to say in the olden days. We finished up by lunchtime, took care of a few details, and now I can heave a huge sigh of relief while Karen gets to start thinking about the editing job ahead of her. I cannot thank you all enough for your contributions to this project. It could never have happened without the help and encouragement from each and every one of you, and it has been a privilege and a pleasure to share this journey with you. I think you get the idea from these emails that recording with Janis was an extraordinary experience, and I'm hoping to repeat it twice more in 2014 when we do Books II and III. I'll announce the Kickstarter campaigns here and on Facebook, and remember, for as little as $1 you can become an official supporter and receive our email updates in real time as the recording happens. To all of you who supported Book I, and to future supporters of Books II and III, thank you so very much for making this project possible. You are true patrons of the arts.